Eagle Falls Lodge is a boat-in lodge on Red Lake and Parker Lake in northwest Ontario. The town of Red Lake is about a five hour drive north of the border. We have a secure parking area on the edge of town where you will be picked up aboard our comfortable barge transport. If you choose to fly we recommend Bearskin Airlines. Bearskin offers daily flights connecting to and from Winnipeg, Manitoba. Please visit their website for more information. We’ll pick you up and drop you off for free if you notify us of your travel schedule in advance. 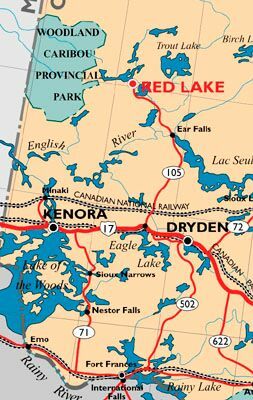 The lodge is situated five miles across the lake in a quiet bay where Parker Lake flows into Red Lake. Enjoy tremendous fishing action without battling any crowds in a relaxed environment.